We offer the best quality English needles available. Note that there are lower quality needles made in other countries so be aware of this when comparing our prices with those of other vendors. Fine quality English beading needles. These are the long needles typically used for loom work and are approximately 2¼ inches long. The blister packs contain four (4) needles. Note that needle sizes really don't correspond to bead sizes. A size #12 needle works fine for size 10/0 - 13/0 seed beads. However, if you are not familiar with needle sizes, it is best to start with a needle size that matches the size beads you are going to work with. Like beads, the larger the number, the smaller the needle diameter. Size #15 is used for very small beads. The "assorted" pack contains one needle of each size 10, 11, 12, and 13. It's a good sampler to learn needle sizes. 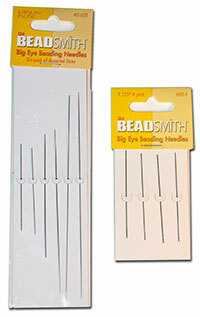 Made from the finest quality English needles, this item is a must for all beaders. With a curved beading needle, beads are less likely slip off of your needle while at work. In doing so, this tool will definitely save you time and effort! Made in England. 2 needles per pack. Fine quality English sharps. These are the shorter needles (about 1¼ inch) that are favorites for lane stitch and other techniques where beads are sewn to leather or fabric. For loom work, most people prefer the longer "beading" needles. Size #10 contains 20 needles. Sizes 11 and 12 contain 10 needles. Big Eye needles are unique in that they are split in the middle forming a big "eye." Some beadworkers find these needles easier to use and thread than standard beading needles. The 2.125 inch size contains four (4) needles, all the same length. The "assorted" pack contains six (6) needles, 2.125" (2), 3" (1), 4" (1), and 5" (2).